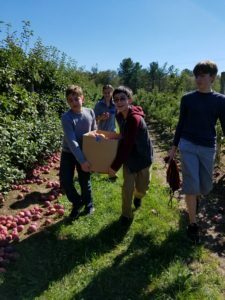 Youth Group combines a balance of fellowship, faith and mission opportunities, and is open to all youth in this and the surrounding communities in grades 6 – 12. Youth and their leaders meet on the 2nd and 4th Sundays of the month from 11:30 a.m. – 1:00 p.m. We will start our year on September 30, meeting in the Edwards Room. Several times a year we gather with sister churches in Northampton for ecumenical youth events. 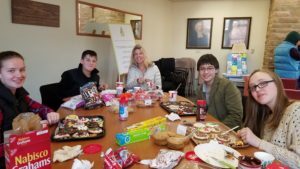 During Lent, members of the youth group invited members and friends of Edwards Church to contribute donations for NuDay Syria. Suggested items included: dry foods, rice, beans (canned or dried), protein bars, toothpaste & toothbrushes, bars of soap, women’s hygiene items, bandages, children’s Tylenol, Neosporin, and Advil. January 13, 2019 – 11:30-1:00 ~ We are going bowling at Spare Time. January 27, 2019 – 11:30-1:00 We’ll attend Annual Meeting and then meet in the Edwards Room.